I love that it's eco- and budget-friendly. Wow! Double wow. That dress is so gorgeous and looks like it fits her perfectly. Holy cow! Spectacular dress! And even more so since it's inexpensive AND re-used AND her size! Triple play!!! And what a great dress too! that is so beautiful! it is actually prettier than a lot of the dresses i've seen nowadays. 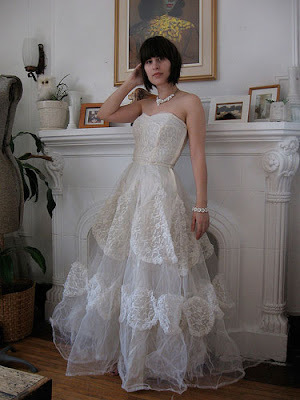 i never even thought about a vintage dress! friggin sweet. do you want to re-sell when you're done? ?